Please consider contributing towards the ongoing running costs and becoming a "Friend of this Website". Any amount is very much appreciated. Costs include Server and technical assistance. When the target is reached any further donations will be carried forward to the next month. Welcome to the The British Merchant Navy - Old Friends Plus. Most users ever online was 7,421, 4th December 2018 at 07:27 PM. The most posters over 24 hours was 88, 9th July 2012 at 09:56 AM. Senior Member and Site Moderator. To help with the ongoing running costs and become a Friend of this Website. 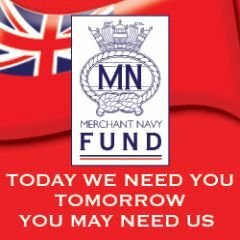 The Merchant Navy Fund is a collaborative initiative by the Merchant Navy Welfare Board and the charity Seafarers UK. Both organisations recognise that many people with a Merchant Navy background want to see their donations, gifts ‘in memory’ and legacies used specifically in support of British Merchant Navy seafarers and their families.